>> Home Organization: 10 Ways to Start Taking Control! Home Organization: 10 Ways to Start Taking Control! Was last year a frustrating and overwhelming year for you, too? As we enter into the new year, you probably find yourself reflecting back on what happened last year and making goals to improve your life this year. Even if you had a wonderful last year you are probably looking for ways we can further improve and take better control of your life. Positive thinking is an important part of this process. Positive thinking allows us to focus on our strengths and the things we have accomplished in the past year. Having an optimistic outlook, making the choice to be happy will help you make progress on your goals and spend less time feeling down and stuck! Here are 10 practical suggestions to develop a positive, successful year! Don’t waste time worrying that you did something wrong unless you have proof that there is something to worry about. Have you ever told a partner “You’re ALWAYS late!” or complained to a friend “You NEVER call me!”? Thinking and speaking in absolutes like ‘always’ and ‘never’ makes the situation seem worse than it is, and programs your brain into believing that certain people are incapable of delivering. In his book “Change Your Brain, Change Your Life”, Dr. Daniel Amen talks about “ANTs” – Automatic Negative Thoughts. You don’t have to be an expert to know the benefits of a good hug. Positive physical contact with friends, loved ones, and even pets, is an instant pick-me-up. One research study on this subject had a waitress touch some of her customers on the arm as she handed them their checks. She received higher tips from these customers than from the ones she didn’t touch! Rumination is like hyper-focus on something negative. It’s never productive, because it’s not rational or solution-oriented, it’s just excessive worry. Try changing your physical environment – go for a walk or sit outside. You could also call a friend, pick up a book, or turn on some music. 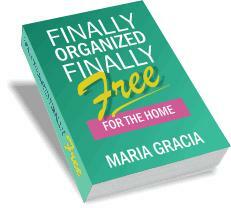 WE LOVE THIS ORGANIZING BOOK! YOU WILL TOO! Are you tired of the clutter in every room of your home? Is your To Do list a mile long? Do you wish your family was better organized? Are you drowning in paper? Are you wondering what you can do to stop procrastinating and start getting things done? Do you want more time in your day for your family and the things you love to do?